***Please do NOT use the "REQUEST TO BOOK" button without first inquiring with us via VRBO for availability/rate quote for your specific arrival and departure dates *Even if your dates show as available on our calendar, we are unable to accept reservations that create unbookable gaps of 3-6 nights between bookings, so please check with us BEFORE booking online to make sure that your selected dates are acceptable. Longer minimum stays may be required depending on the existing opening. Maximum occupancy is 8 guests including children 3 years of age and over. Up to 10 guests allowed if at least 2 of the guests are infants/toddlers under the age of 3. Bliss Beach House (Legal Vacation Home: Maui County STRH Permit #STKM 2013/0008) is a casual and relaxed beach house in a quiet kamaaina (local family) neighborhood in central Kihei, 1 block from the ocean (no sandy beach) on the ocean side of S. Kihei Road and just 1 mile along the coast to the sandy Kamaole beaches in S. Kihei. With 4-bedrooms and 3 baths + family/gameroom, this remodeled 'beach-chic' family-friendly property has a huge resort-style pool and game room with Big Buck World arcade game located in a separate wing from the main living area, providing a fun play area for kids of all ages. Within 1/2 -1 mile, there are a variety of shops and dining options as well as Kalama Park with a skate ramp, public tennis courts, and basketball courts, and surfboard rentals. Within a few minutes drive, there are 5 sandy swimming beaches in South Kihei, the closest one is less than 1 mile away, so you can try out a different gorgeous beach each day! -Variety of board games, puzzles, and toddler toys (Fisher-Price play table/kitchen and wood blocks) as well as a baby activity center. -Maximum occupancy is 8 guests including children 3 years of age and over. (Children under the age of 3 are always welcome!) Up to 10 allowed if 2 of the guests are infants or toddlers under the age of 3. -Bliss Beach House is a casual and relaxed beach house, not to be confused with or compared to a luxury home, and we would never represent it as such. It is clean, quiet, tastefully furnished, and extremely well-equipped. It is located in an older kamaaina (local family) beach neighborhood ('5-star hotel folks'- this is definitely not the right property for you), so please be sure that everyone in your travel group is made aware of this so that everyone has a Blissful time on Maui. QUIET HOURS ARE FROM 8PM-8AM: Quiet Hours are a County requirement for licensed vacation rental homes like this one. The Bliss Beach House is located in a residential neighborhood and Guests must be aware and respectful of neighboring properties at all times. Noise carries at night and although the Bliss Beach House guests are on vacation, our neighbors are not, therefore ALL outdoor activities, including outdoor conversations, must be brought inside the home by 8pm. Please be sure that ALL the members of your group are aware of the quiet hours and will be able to comply BEFORE booking this property. We want you to have a fantastic and Blissful time on Maui- we promise we won't impose many rules on you at all, but the quiet hours restriction is one of the very few! GROUP GATHERING RESTRICTIONS: Part of a larger group all visiting Maui at the same time? Have friends and/or family living or staying on Maui? Visiting Maui for a wedding or reunion? Please note that our County vacation rental license restricts the use of this property (day or night) to the registered guests only so any friends and/or family not staying at the house would be unable to come over for shared meals or pool time. ***PLEASE NOTE*** Any group that includes someone getting married on Maui, groups coming to attend a wedding on Maui, or groups renting more than 1 property on Maui must disclose this to us and must receive pre-approval from us BEFORE booking as we are normally unable to offer the Bliss Beach House to these type of groups. We are an active international Hawaii-based family blessed with 3 wonderful children and we love to travel- we are always getting new ideas for our properties while staying in other places on our family vacations! Thank you for considering our home- we hope to help make your next Maui vacation as easy, relaxing and memorable as possible. We take great pride in providing our guests with top quality properties that are renovated, modern, and conveniently located in sunny Kihei, Maui. We fell in love with the huge pool and the location on a quiet dead-end street, and close to lots of shops and dining options. 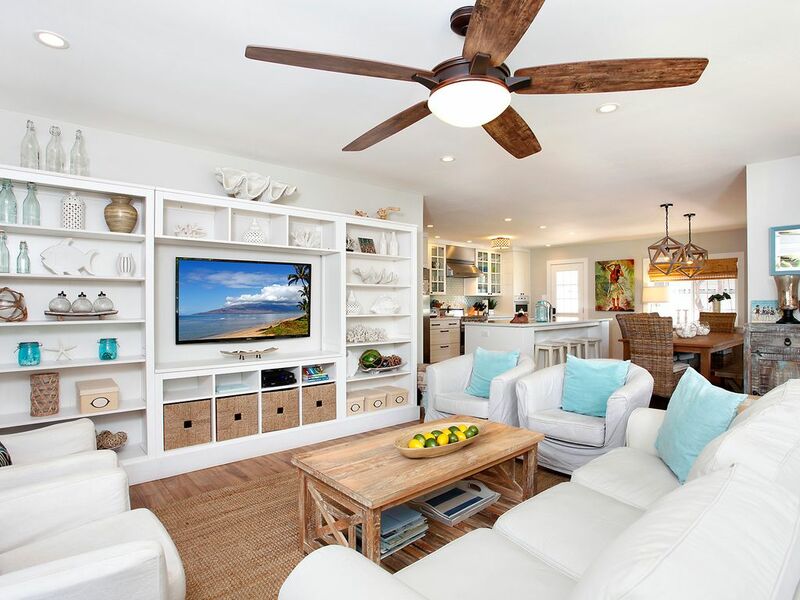 Painstakingly remodeled for our family's personal use, the Bliss Beach House is our family's personal home for part of the year, and we are pleased to share this special property with others when we are unable to be there ourselves! Our family and friends love the great pool and the fun game room with Big Buck World arcade game! Zoned A/C in the living areas and ALL 4 bedrooms starting June 2017! Electricity for A/Cs is metered separately; $20 of daily usage (10-12 hours of daily use ) is included free of charge. New kitchen with Viking range and quartz counters. Fully-equipped with quality pots/pans, dishes, utensils, blender, rice cooker, coffee grinder, etc. Big Buck World arcade game, Foosball, poker table, family board games, XBox 360, and large TV with video library. Surf and Stand Up Paddle (SUP) rentals and lessons at nearby Kalama Park, a few blocks away. The home is beautiful, stocked with everything you could possibly need, very comfortable and clean. The owner is amazing to work with, they even put up a beautifully decorated Christmas tree when we stayed over the Holidays. There were 8 adults and 3 children in our family stay, the game room made it so fun for both the kids and adults. It was an easy walk to the beach and the house provided plenty of chairs, umbrellas, boards and beach toys. We had so much fun and would definitely stay again. The front facade of this property does not give away the amazing interior & pool area out back. i must admit I was a little bit hesitant when we drove in the driveway, as I had picked this property for 8 adults. On entering the front door, straight into the kitchen, it was like stepping into another world. A large modern kitchen with everything you could need. We where meet by Sheena on behalf of Misty. Who gave us a tour of the house, giving lots of details on everything we needed to know to make our stay more comfortable. All four bedrooms where of a very good size & the 3 bathrooms made getting ready for a wedding so much easier. The outdoor area, was utilised to a max. Whether it was dining outside or sitting out of the sun, the added area made it feel like you where in your own private resort. which we where. The second lounge/games room came in very handy,with the males playing games, whilst the ladies sat in the other lounge area. The pool was fantastic being shallow one end & much deeper the other end. Only draw back we found was the concrete got very hot & have mentioned this to Sheena on our departing. I cannot praise this property enough. It truly met all our requirements & more. Misty had left a lovely flower arrangement, a food hamper & cold beers in the frig & a basket of chocolates. which was much appreciated by all. We even had a call from Misty apologising for not being there on our arrival & advising if we needed anything just to ring. In all my travels, I have not experienced the service we received from Misty &Sheena. We will return to Maui & rent this property again. PS.If you dont rent this property you are missing out. The Bliss Beach House has a really great location and was stocked so well with everything we needed! The beach directly behind the house is not ideal for swimming but there are so many turtles basking in the sand! Like Home,warm personal greeting,Pool A++++,great base for adventures,quick sunset walk,private!! Bliss House is a home run! We stayed 10 nights. House is well stocked with coolers , boogie boards, beach chairs, and umbrellas. Centrally located in Kihei as a home base for all of your island adventures and is close to great restaraunts. House is super private, lovely beach decor, with high end landscaping front and back, huge gorgeous modern clean sparkling pool, outdoor dining and lounging area. Misty is an amazing owner/host - her personal greeting, home tour, and generous gift baskets for adults and kids immediately put us into vacation mode. Maui sunsets are a 2 minute walk away from Bliss house and we enjoyed many! Layout of the house is very comfortable and provided separation for the big and little people in our group of 4 adults/ 4 children-- the game room/poker/foosball/couch/video game room were awesome and the open kitchen, DR, LR area was a hit for adults as well. Pool and outdoor space is great with many lounge chairs, seating, pool toys, and outdoor dining options and we utilized them all! Super well stocked kitchen, we cooked-in several nights and the 2 washer dryer units were key! We will be back!!! We cannot say enough good things about the beach house accomodations. We loved the beach theme decor throughout the house and used the beach chairs and boogie boards daily! We enjoyed eating dinner outside each night and spent endless hours enjoying the pool and soaking up the Maui sunshine on the chaise lounges. The house was perfect for our family of 8 and is close in proximity to many of Maui’s beaches. We actually preferred staying in the quiet residential neighborhood over a resort and enjoyed the private pool immensely. We would definitely book this home again for a future stay on Maui! !